Just a year ago we planted vines again on the same land where our estate vineyard was planted decades ago. Though these vines have unexciting names, like 07355-075, this is very exciting stuff for us and other California winegrowers. After years of hard work in the labs at UC Davis, Dr. Andy Walker released a unique set of new wine grapes that were bred for Pierce’s Disease resistance. The most staggering part of his work is that he used traditional hybridization (and years of it) to create these varieties, not genetic engineering (GMO). Though not officially released yet, we were able to obtain an allotment of these cuttings to fill out 1.2 acres. These grapes are a game changer for our region. Our original estate vineyard (planted with Syrah and Sauvignon Blanc in 1983) only thrived for a decade or so before Pierce’s Disease ravaged it. In the early 90s our region was invaded by a new pest from the Southeast, the Glassy-winged Sharpshooter, which was a devastatingly powerful vector for Pierce’s Disease. There were other sharpshooters before (the blue-green and green varieties) which also spread PD but were too small to fly far from creek beds. The larger glassy-winged type can cover distance, and feeds more to do it. The bites from these bugs spread a bacteria called xylella fastidiosa, which infects and clogs the water transporting tissues in the vine. Over a year or two the infected vine’s vigor plummets, the canes become blotchy and stay thin, the leaves get progressively red and crispy at the edges then fall off, leaving “matchstick” petioles poking out. That’s PD, and at that point all that makes sense is to stop watering and bring in a backhoe to make the sad mess go away. The University of California map below confirms that we’re thoroughly infested with Glassy-Winged Sharpshooters here in Ventura County (Temecula bears a heavy load too). People plant grapes anyway, of course. Most are relying on gnarly neonicotinoid chemical pesticides to stave off the malady. 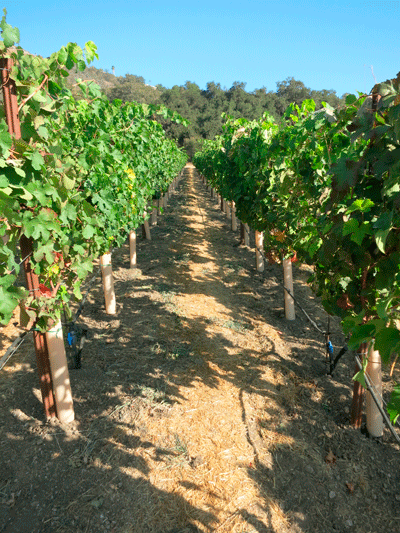 The relative isolation of our Upper Ojai vineyards helps with prevention to some extent, though we continue to lose vines and are continually replanting to keep those vineyards going. So these new vines open up a new future. For years it made no sense for us to plant again—it costs a lot for us to keep Roll Ranch healthy and it’s a struggle—the risk and work to take on another such site was too much to bear. Now we and others can confidently move forward to express our Southern California sunshine with novel varietal expressions that we can’t wait to have in our glasses. And so a bit about what to expect—well, we’re not sure! We can say that this work involved breeding a Southwest-native grape, Vitus arizonica, with European varietals of Vitus vinifera (the grapes you know from drinking wine). This was done again and again, crossing more vinifera into the native hybrid until it was 97 percent vinifera and just 3 percent arizonica. At this point an expert tasting panel declared that the negative sensory attributes from native genetics were gone (American grapes are said to make a “foxy” smelling wine, which is to say not the kind of foxy implied in Hendrix’s “Foxy Lady”). Yet that final 3 percent of the Southwest-native grape conferred effective resistance to xylella fastidiosa / Pierce’s Disease—well done, Dr. Walker! Adam went up to Northern California for a tasting of wines produced from existing experimental plantings and saw promise in the fruit. One white was more in tune with Chardonnay, another more with Sauvignon Blanc. Two reds were on the richer side and the other was more juicy and bright. The wines were produced in very small batches though, so things will be different after aging in French oak barrels. We planted all five varieties last August in a densely-planted Vertical Shoot Positioning setup to provide ideal fruit shading in our warm climate. After a slow start from summer planting and the cool Spring we had this year, our new vines have now taken off with thick, vigorous shoots. Eventually the idea is we’ll get enough fruit to make a separate barrel of each variety and geek out on the resulting wines. Perhaps a conference with other growers and industry folks will make sense (we could come up with better names)? In any case, stay tuned for interesting things to come from our work with this fruit! And check out the Wine Business article to read more about these new grapes and Dr. Walker’s work.